Apple claims that iOS 6, the next version of its iPhone and iPad operating system, is "compatible" with devices as old as the iPhone 3GS. The 3GS was originally released nearly three years ago in June 2009 -- an eternity in gadget time. However, at the bottom of Apple's iOS 6 info page lies a small disclaimer: "Not all features are available on all devices." This is followed by eight footnotes detailing exactly which features work on which devices. Some features, like the VIP List for email, the Offline Reading List, and Shared Photo Stream won't work on the iPhone 3GS. 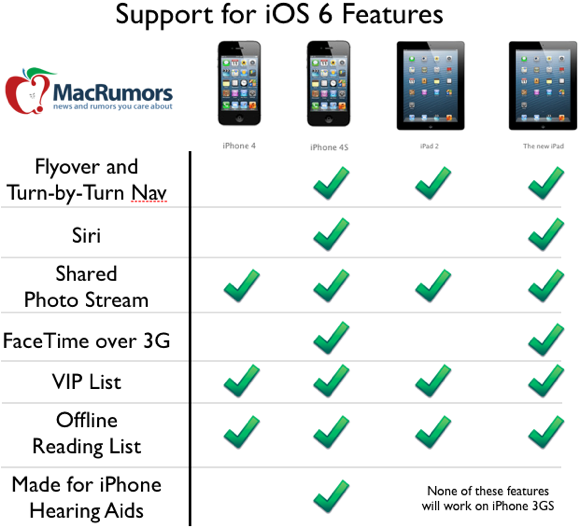 Even flagship iOS features like Siri and FaceTime over cellular won't work on recent devices like the iPhone 4 or the iPad 2 -- not to mention the iPhone 3GS. All that said, however, iPhone 3GS owners will receive iOS 6 features like redesigned App and Music Stores, Cloud Tabs in Safari, Facebook integration, and other improvements -- it just won't include nearly the same number of features as the owners of Apple's latest and greatest gadgets. What on earth is preventing FaceTime over cellular on the iPhone 4? "Android is fragmented. But iOS isn't." Where's the sandbox so I can put my head in there with all the other people claiming this ? Because the android version of this chart would have over 2000 devices? I know this is par for Apple's course, but as an iPhone 4 owner, I still say "Ugh!" And this isn't fragmentation? How funny that Apple of all companies, who rips on Android for be fragmented, goes and fragments the whole OS. Again, people, Apple doesn't care about the consumer. What reason is there for not enabling Face time over 3G on the iPhone 4? Skype can do it fine, and so can jailbroken handsets. Apple doesn't care about you, they simply care about bilking more money out of everyone! Is it just me or does anyone find it odd that the iPhone 4 is getting lack of support? The difference from the 4 and 4S aren't that huge. With the exception of Siri (and I still think Siri should of been added on the iPhone 4) this is ridiculous. I can understand the 3GS completely but not the iPhone 4.